I head out for a short run. It’s supposed to be a day off, but an unfortunate encounter with a plate of peanut butter cookies means I can either run or eat sticks for the duration of the evening. And I had sticks for lunch. I’ve been listening to Steely Dan during a lazy late afternoon. Because Mo’s at work, and well, they’re Fagen and Becker. So I throw on the headphones and take the boys along with me into the darkness. I’m about a mile into the run. It’s a cool evening after a day of thunderstorms terrorizing BK. The air has that just-rained smell. I dodge puddles and float along under the occasional streetlights. Spotify cues up song after song. I hear the opening notes of Reeling in the Years. And I start crying like a baby. I’m standing in the parking lot of the First Baptist Church, an emotional train wreck. What to do? I sit down on the curb and drift back in time. It’s 1974 again. Charlie and I are in his bedroom. He is introducing me to a substance that only much later did I find out was apparently illegal at the time. But I don’t notice much of a difference. Until. He puts on the Can’t Buy a Thrill album (they were vinyl things with music on them. Look it up on wikipedia), which he has just obtained. We were a couple of years behind musically in San Angelo, you know. The stylus goes down (it was called a record player. again, wikipedia.) As that first guitar riff of Reeling in the Years floats over us, the little statue on his dresser starts dancing around. I had never heard a song in 3-D before. A thrill indeed. From that day on, Reeling in the Years has had a special place in my heart. I never heard it in quite the same state again, but I had the memory. Of a song, a day, a friend, a bond. Charlie was my best friend during those wonder years, the guy who got me through junior high and most of high school. We took art classes together, teamed up in bands, spent all our time together. His mom referred to me and Ronny, the drummer, as her girls. We were like that. And then college came along. He packed up the Hammond B-3 and headed for North Texas State to follow his musical muse. 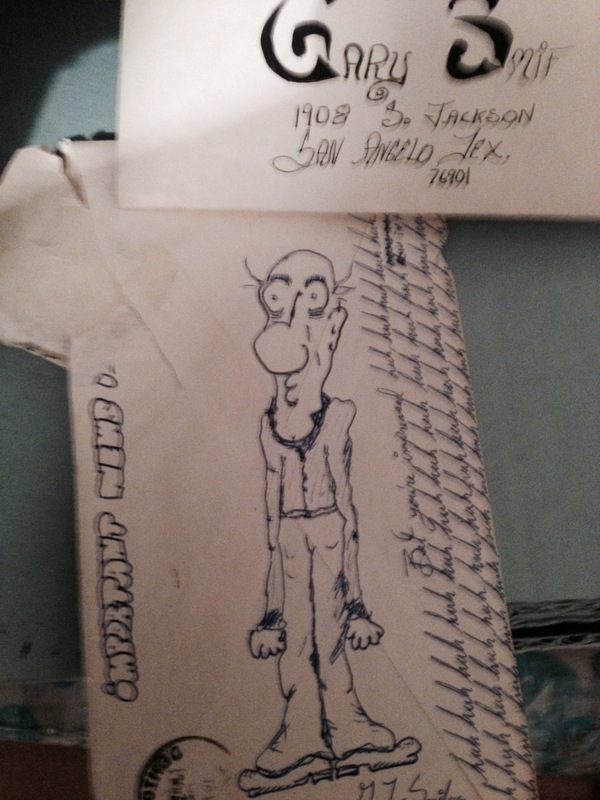 He would write letters now and then (no, we didn’t have texting), but we grew apart, as old friends always do. Life, you know. Then one day I heard the news. He had been driving home in the wee hours from Dallas to Denton after a gig. Lost control of the van. Died. Completely. I’ve thought about him a lot over the years. When I went through the dark years and chunked all my possessions at one point, his letters were one of the few things that made the cut. But life is busy; you forget. Until fate and a random logarithm conspire on a nighttime run to bring him back in an empty parking lot. I get up after the song ends and continue my run. I sift through the memories. More red in the rockets. The tablecloth trick. The damn Leslie box. Those corduroy pants. That ability to talk anybody into anything. The high harmony on Teach Your Children. The magic that surrounded him. I knock out 3 miles, just enough to ensure a peanut butter sandwich for dinner. As I’m heading into the last straight, there are the notes again. In a catalog of hundreds of songs, Spotify is playing our song for the second time in a half hour. I’m pretty sure it’s Charlie messing with me. This time, no tears. Just a smile. A little prayer for his kid, wherever he is. Gratitude that he came into my life. A silent vow not to forget. Songs and music are such great for life long memories. The day I began sitting with my brother on his final 6 days my I lost my good friend and college roommate suddenly to a massive coronary. I haven’t had time to deal with Keith’s death. Then last night I saw Dr. John in a Treme Movie. Keith and I saw him on the Wharf in NOLA in 1985, the Neville Brothers were the main attraction, but Dr. John it happened in the right place, but it must of been the wrong time song stands out. Another touching blog Garbo, two in one day hit me between the eyes! Thank you. I was way too young back then, when those songs came out, and I haven’t tried any illegal substances (knowingly), but I still love both songs you mentioned. And I love the way you expressed your feelings. I was introduced to Steely Dan on similar vinyl, but I think it was 1985 for me. Peace.